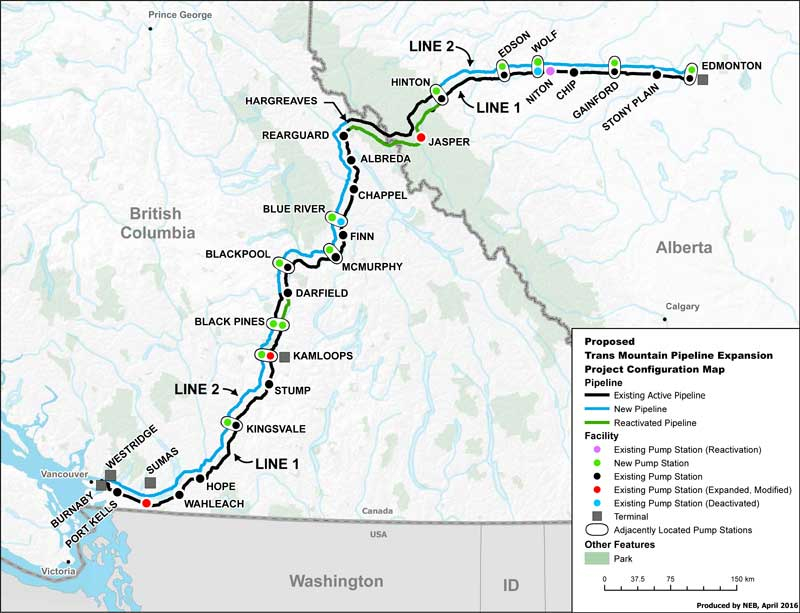 The Trans Mountain Pipeline Expansion project is an expansion of the original Trans Mountain Pipeline (built in 1951), a 1,150 km pipeline between Strathcona County, Alberta and Burnaby, BC. in Canada. The pipeline is the only West Coast link for Western Canadian oil. The expansion (in the form of a parallel pipeline) is expected to almost triple the capacity of the system, taking an additional 590,000 barrels of crude oil from the Alberta tar sands each day to the Burnaby refinery on Vancouver Harbor. From there, the oil would be loaded onto supertankers to be shipped out across the Pacific. The projected capital costs amount to CAD 7.4 billion. The project is being developed by the largest energy infrastructure company in the US, Kinder Morgan. The original Trans Mountain Pipeline started operations in 1953. In 2008, Kinder Morgan completed a second pipeline, running parallel to the first, for the portion of the pipeline running between Hinton, Alberta, and Hargreaves, British Columbia, increasing capacity by 40,000 barrels per day to 300,000 barrels per day. In 2013, Kinder Morgan filed an application to the Canadian National Energy Board for building a third pipeline named the Trans Mountain Pipeline Expansion Project. The third pipeline was to run roughly parallel to the existing pipeline, between Edmonton and Burnaby, (east of Vancouver), and to be used to transport diluted bitumen. The additional pipeline requires twelve new pumping stations. The proposed expansion, with 980 kilometres (610 miles) of pipe, would almost treble the system's capacity from 300,000 barrels a day to 890,000. The Trans Mountain Pipeline Expansion is one of a handful of pipeline projects which are together designed to accommodate a massive increase in production from Alberta's tar sands industry. In addition, the pipeline violates Indigenous rights including FPIC, and is being fought by many First Nations peoples who will be directly impacted. Private sector banks and others should refuse to finance this project and related companies, and redirect their investments into sustainable environmental solutions. The TMEP would draw heavily on supply from the Alberta tar sands in Canada. These bitumen deposits require a lot of effort to extract, recover and pre-process before the oil can be sent to conventional refineries. Most of the current extraction process takes place in open-pit mines, with massive machinery scraping up the tarry sandstone and moving it to facilities for processing. The heavy crude is found mixed with sand, clay, and water, which must be removed, then the heavy crude must be "upgraded" to reduce viscosity and improve quality (sources The Atlantic, Greenpeace). This process has destructive impacts on the land and means a heavy carbon footprint during the laborious extraction and upgrade process, as well as massive amounts of toxic byproducts. Studies show oil sands crude emits more greenhouse gases than conventional crude oil. In 2014 production of tar sands in Alberta was 2.3 million barrels/day ( www.energy.alberta.ca). This expansion will carry an extra 590,000 b/d (i.e. a quarter of current production), and “companies operating in the oil sands have approvals to produce over 5.2 million barrels of oil per day” (credbc.ca). Abbotsford 2005: A ruptured pipeline dumped 210 cubic metres of crude oil. The company attributed the accident to activity in a neighbouring property. Burnaby 2007: A contractor working on a sewage project for the City of Burnaby ruptured a pipeline, causing spillage of 224-234 cubic metres of crude oil, some of which flowed into Burrard Inlet via the Burnaby storm sewer system; most of it was recovered. Eleven houses were sprayed with oil, and about 225-250 residents were evacuated or left voluntarily. Cleanup took more than a year. Source: report by the Canadian Transportation Safety Board. Burnaby 2009: 305 cubic metres of crude oil were released from a tank in the Trans Mountain Burnaby Terminal, most of it flowed into a containment area. Sumas 2012: 90 cubic metres of light crude oil leaked from a Sumas Mountain holding tank, all of it flowed into a containment area. The existing and proposed pipelines ship diluted bitumen through the Strait of Juan de Fuca, an extremely sensitive environmental region. The tankers have to pass through a very narrow channel of shallow water to reach the open sea, making the project controversial and strongly opposed, for reasons similar to the opposition to Keystone XL, Line 9 and Northern Gateway, as well as offshore deep ocean oil drilling. A July 2017 Greenpeace report concluded: oil spills anywhere pose serious risks to human health and the environment, and oil spilled into bodies of water is difficult to fully clean up. Diluted bitumen transported from Canada’s tar sands fields represents a particular threat to water resources along the routes of proposed pipelines. The expansion of the Canadian tar sands, from which this project derives its oil, would lead to increased destruction and poisoning of the lands, waters and air of the Indigenous Peoples directly on the front lines and downstream of the tar sands. Furthermore, the communities would be threatened by more possible oil spills from the pipelines, trains and tankers (source: Treaty Alliance). This project does not have the Free, Prior and Informed Consent (FPIC) of the Indigenous people it will affect. First Nations tribes that would be directly impacted by the route and port terminal are fighting the project in the courts and leading heated protests on the ground. The Tsleil - Waututh, Squamish, Musqueam, and Sto:lo First Nations, whose territories cover most of Metro Vancouver Area, are among the nine First Nations and Tribes currently in litigation against the project. The Coast Salish, Sto:lo, Nlaka'pamux, and Secwepemc Nations, whose territories cover more than half the length of the pipeline, have also filed legal challenges to the project. As with the Dakota Access Pipeline, a highly controversial project constructed without FPIC of the Standing Rock Sioux Tribe and other affected tribal nations that source their drinking water from the Missouri River, the Trans Mountain Pipeline expansion also poses a grave threat to Indigenous People, as described in this letter written by several NGOs and groups of Indigenous people to 28 banks involved in financing this project. Kinder Morgan's Chairman Steve Kean announced he would scrap plans to nearly triple the capacity of the Trans Mountain pipeline, which takes crude from Alberta’s oil sands to a facility in the Pacific province of British Columbia, unless the various legal challenges could be resolved by May 31 (Reuters). A report published by the Indigenous Network on Economies and Trade has laid out the flawed valuation that Kinder Morgan Canada has projected regarding the Kinder Morgan Trans Mountain Expansion Project (TMEP). The company was named to have failed on multiple bases in crucial areas to account for the lack of political, legal, and proprietary certainty surrounding the pipeline. Canadian lender Desjardins is considering no longer funding energy pipelines, a spokesman said on Saturday, citing concerns about the impact such projects may have on the environment. Desjardins, the largest association of credit unions in North America, on Friday temporarily suspended lending for such projects and may make the decision permanent, spokesman Jacques Bouchard told Reuters by telephone (source Financial Post). Kinder Morgan Canada Ltd has raised CAD 5.5 billion (USD 4.16 billion) for its Trans Mountain Pipeline Expansion Project and could have raised even more, the company said on Friday, despite pressure on banks to back away from the project. Energy infrastructure projects have faced opposition from environmental groups and aboriginal communities whose land they touch. Opposition to Trans Mountain is set to mount after the effective rise of an unfriendly government last month in Canada's British Columbia province that the pipeline passes (source Reuters). Over 20 Indigenous and environmental organizations delivered an open letter to 28 major banks, calling on them to back away from funding the Trans Mountain pipeline expansion project (TMEP). The warning letter urges banks to avoid the reputational and financial risk of supporting this destructive project, which is incompatible with realizing the goals of the Paris Climate Agreement and respecting human rights, especially those detailed in the U.N. Declaration on the Rights of Indigenous Peoples (source Advnf.com). Environment Minister Mary Polak and Natural Gas Development Minister Rich Coleman have issued an environmental assessment certificate to Trans Mountain Pipeline ULC for the B.C. portion of the Trans Mountain Expansion project, which is an interprovincial pipeline approximately 987 kilometres long between Edmonton, Alberta and Burnaby, British Columbia (source BC Gov News). On November 29, 2016, the Government of Canada granted approval for the Trans Mountain Expansion Project. The expansion concerns the existing 1,150-kilometre pipeline between Strathcona County (near Edmonton), Alberta and Burnaby, BC. The expansion will create a twinned pipeline increasing the nominal capacity of the system from 300,000 barrels per day to 890,000 barrels per day (source Trans Mountain). In April 2017, Kinder Morgan filed for an IPO to finance the CAD 7.4 billion Trans Mountain Expansion Project. The IPO closed on May 31st, raising CAD 1.75 billion. The company then established a CAD 5.5 billion credit facility, of which CAD 5 billion is specifically for the costs of the Trans Mountain Pipeline Expansion, making the credit facility effectively a project related corporate loan. A total of 28 banks have been involved in financing Kinder Morgan through corporate loans and underwriting. TD Bank and RBC are leading finance for the pipeline - the banks were the main underwriters of the credit facility, and also the joint bookrunners of the IPO, via TD Securities and RBC Capital Markets. More details on this is provided below. Pipeline poker: How the Trans Mountain expansion project could play out in B.C. Are we ready for oil spills in the Salish Sea? Does your money fund oil pipelines?